British comedy “Shaun of the Dead” became a bit of a cult hit here in the United States way back in 2004. It introduced American audiences to the comedy trio of director Edgar Wright and actors Simon Pegg and Nick Frost. The film was a send up of zombie flicks with a fun romantic comedy bend. It was heartfelt and gory as hell. Just a few years later the same team spoofed buddy action comedies in “Hot Fuzz.” It was a bigger hit, though I found it to be somewhat disjointed. And here we are in 2013 with the conclusion of the group’s “Cornetto Trilogy” (a brand of ice cream that can be seen in each film) “The World’s End.” This send up of the science-fiction genre is basically a parody of “Invasion of the Body Snatchers.” It’s a fine ending to a good set of films, but “Shaun of the Dead” is still the best of the bunch. 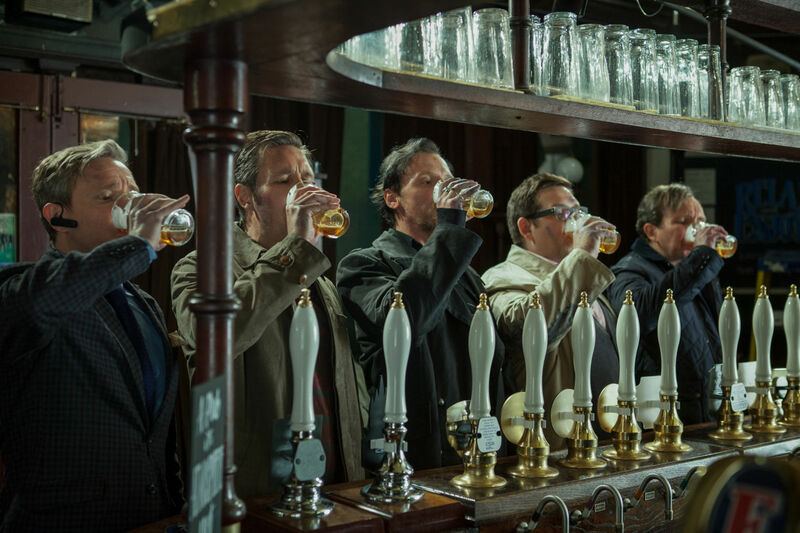 A sort of British version of the Seth Rogen comedy “This is the End,” the apocalyptic comedy “The World’s End” marks a real maturation at the hands of director/co-writer Wright. He constructs a touching story of a man who refuses to grow up. Pegg plays Gary King, a disheveled middle-aged alcoholic who has become estranged from his group of four more successful friends. He impulsively insists on getting his group back together to complete the Golden Mile - a pub crawl the clan had attempted, but didn’t complete during their youth. The final stop is the World’s End pub. He manipulates each one of them into reluctantly joining him which include his closest friend Andy (Nick Frost), Peter (Eddie Marsan), Oliver (Martin Freeman), and Steven (Paddy Considine). Lots of things from their pasts are brought up as the quintet begins their binge but soon something ruins their evening. As their evening wears on the guys notice that some of the townsfolk have been acting strangely, and a young man attacks one of them in the bathroom. The young lad’s head is accidentally ripped off making blue goo spray all over the place. An extremely well-choreographed fight ensues as the young guy’s friends begin to attack the older guys. It seems as though the townsfolk have been somehow transformed or replaced by robots. The group decides it’s best to continue on with the crawl as to not cause suspicion. It’s all just as ridiculous as it sounds. Wright uses all of his flashy trademark visual tricks that he’s employed in all of his films. There’s lots of quick editing and fast whip pans and quick zooms. It’s a style he’s obviously very comfortable with now. But for all of the familiarity he brings to the movie, there’s also a surprising amount of depth here as well. At its core, this is a story about a very lonely and sad alcoholic. He’s very much alone in the world and he’s faced with the possibility of the world literally coming to an end. It’s this mix that sets the movie apart from other spoofs and parodies out there. It has a perfectly balanced mix of sci-fi fun with the dramatic weight of something more significant. Pegg who co-wrote the film is obviously a big movie fan and they have consistently found ways to add in nods to their favorite movies such “Casablanca” and “Aliens.” And I couldn’t have been the only one to be reminded of Jaws when the group is forced to show their scars as a way of proving they haven’t been replaced by a robot.